Los Angeles, CA – Fatso, the beloved 1980 comedy from Brooksfilms, starring Dom DeLuise (Blazing Saddles), and the only film written and directed by the legendary Anne Bancroft (The Graduate), will be bowing on Blu-ray™ on June 25 from Shout Select. The release features new interviews with producers Mel Brooks and Stuart Cornfeld, as well as film historian Maya Montañez Smukler, author of Liberating Hollywood – Women Directors and the Feminist Reform of 1970s American Cinema. This boisterous, heartwarming comedy about a man caught between his health, his self-esteem and his appetite, highlights DeLuise’s genius for blending pathos and comedy. Bancroft’s deft direction brings to uproarious life the joys and struggles of our relationship with food. All his life, Dominic DiNapoli (DeLuise) has found comfort in food. But when his sister Antoinette (Bancroft) implores him to stop eating himself into an early grave, Dominic begins bouncing from crash diets to the support group “Chubby Checkers” to all manner of binges in between. In the end, Dominic discovers that what he needs most is a steady diet of love — from his family, from a new and lovely neighborhood acquaintance … and most importantly, from himself. 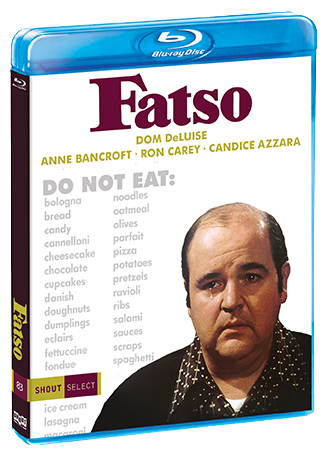 Fatso is available for pre-order at Shoutfactory.com.